Keishu Takeuchi (1861-1942) "Day Break" - Woodblock - Chinese and Japanese woodblock prints for sale, silkscreen, scrolls, watercolor, lithographs. Artwork Details for Keishu Takeuchi (1861-1942) "Day Break"
Condition: Printer's crease mid left; red ink transfer top right; lightly soiled; Usual kuchi-e folds. Notes: From the Bungei Kurabu novel, "Dawn" in vol.18, Number 1 (1912). 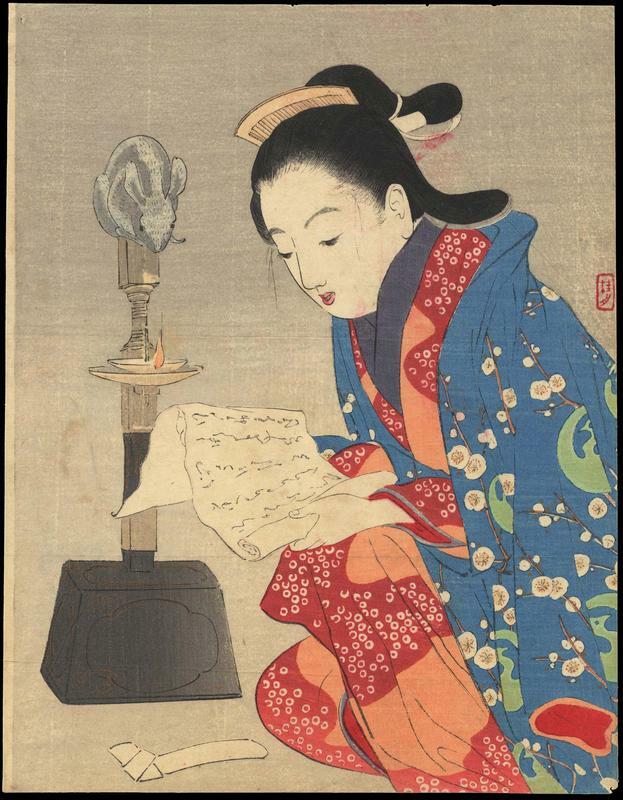 A young bijin reads a letter by an oil lamp.